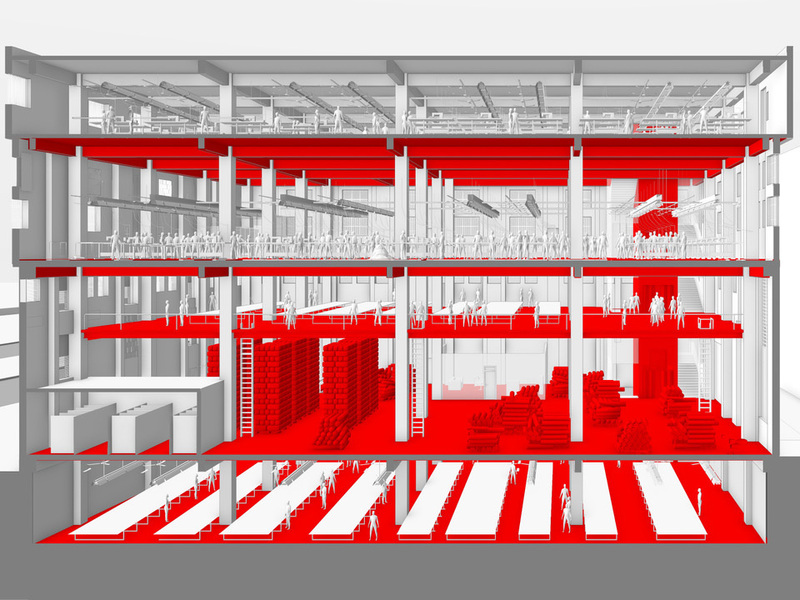 Forensic Architecture, The Ali Enterprises Fire, 11 September 2012, 2018, Sectional view of the Ali Enterprises factory with main lift shaft highlighted. The shaft contained cavities, which exacerbated the spread of smoke and fire. Exploitation of workers across supply chains in the UK and abroad is a growing threat to human rights. With the exposure of labour abuses in the garment industry in Leicester to global corporations headquartered in London implicated in using child labour in Turkey or Indonesia, the pursuit of corporate accountability is critical for the effective protection of human rights. However, with many states retreating from their obligations and creating obstacles to workers organising and barriers to accessing justice, what options are there? Collaborating for the first time, the Human Rights Lawyers Association (HRLA) and Institute of Contemporary Arts bring together Shanta Martin from Leigh Day, Christina Varvia from Forensic Architecture, Jenny Holdcroft from IndustriALL Global Union and Dr Anil Yilmaz-Vastardis from University of Essex School of Law and the Human Rights Centre to discuss active strategies in their work. Chaired by Krishnendu Mukherjee from Doughty Street Chambers, who has worked on the environmental damage caused by business operations in India, this discussion will explore the opportunities for effective legal interventions into labour conditions. The panel interrogates new methods of promoting accountability, from strategic litigation to negotiating private agreements and from advising companies around best practice to developing forensic methods of investigation. Forensic Architecture will screen part of their video report analysing a factory fire in Pakistan in 2012, in which the alleged failure to fulfil safety measures contributed to the death of 260 workers. This investigation grounds the discussion in an understanding of the obstacles and opportunities encountered in securing accountability. The findings have been submitted to the Regional Court in Dortmund, Germany, where legal action against the company who sourced clothing from the factory is ongoing. Christina Varvia is Deputy Director of Forensic Architecture, a research agency that investigates state violence and human rights violations using architectural techniques that unfold in space and time. Shanta Martin pursues groundbreaking litigation to tackle modern slavery. In a recent case, she secured significant compensation against a British company for six Lithuanian human trafficking survivors. Jenny Holdcroft represents workers across the world. She has negotiated agreements with major retailers to recognise unions and collective bargaining, and is involved in the Accord on Fire and Building Safety in Bangladesh. Dr Anil Yilmaz-Vastardis’ research seeks to push the boundaries of English common law to promote accountability across national and international supply chains and provide a critical perspective on international investment law.